The Caterpillar struggles to keep up with the constricted space. While it doesn't even have any idea how and when the space around it shrank so much. And one day as it tries to push the walls of the cocoon to stretch its arms, something, somewhere snaps and through the darkness, a ray of light appears. As it shuts its eyes from the blinding light and meekly tries to gather itself from the fear of unknown, the cocoon gives up and shatters, and breaks, and falls apart. The caterpillar is startled of what has just happened, but not even a moment of that fear has gone by when it finds itself astounded by what it sees all around. An enchantingly beautiful view is present in front of it and it gawks open mouthed all around to absorb this new world. Even before it can marvel the wonder called nature, it realizes something is different about itself too. It looks left and right, and left and right, and again, and again and with a sigh of disbelief raises and spreads it's newfound 'wings' and cheers joyously to the amazing world that is now open for it to fly freely and discover. 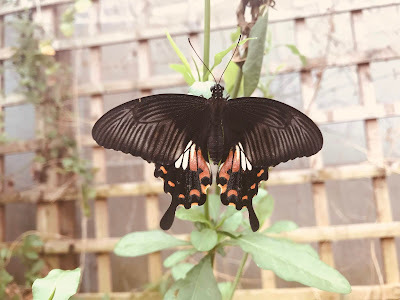 This beauty stole my heart at Butterfly Park in Stratford upon Avon! My kiddo asked why are they called "Butter" fly? Could you imagine yourself being that Caterpillar that turned into this Butterfly? I can. Because I have been that Caterpillar. A shy, timid, protected child of a middle class family who didn't find her small town, somewhere in the largest state of India, good enough for her higher education and instead decided to measure the length and breadth of the country in search of quality education. You can read the above story again and imagine me instead of that caterpillar and you will be able to relate with me when I tell you that I find myself more settled traveling to unknown places than being actually 'settled' at one place. Or when I tell you how excited I felt on being selected in a MNC that required me to shift base to south India, even when it meant going all alone and living in a place full of strangers and unfamiliar language. Or when I tell you what I said to my father who felt sad that marriage will take his youngest darling daughter further away from him. I told him, "Cheer up, your daughter will no more travel alone. She is getting a travel buddy for life." 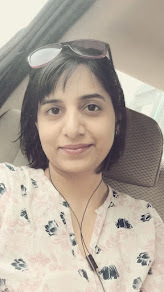 Or when I tell you how I must have become a travel inspiration for his destiny that played along and presented him with an opportunity so that we would leave our 'settled' life in India and along with our two kids move base to the United Kingdom. Or when I tell you that even moving to the Great Britain is not enough for our travel appetite. Well, which travel addict won't have Europe in his or her Bucket list? But the world is not enough, is it? My experience of breaking free from an insulated life to explore the world is inexplicable and inexpressible. You can only feel what I have experienced if you could walk in my shoes. But still, I can try to put in words something, that travel, especially traveling to unknown boundaries with nothing but an open mind, is a Nirvana experience. You might not be able to tell or explain what you have become but yet, you know in your heart what you have found is something precious and forever. Because I didn't just discover the beauty of the world when I stepped outside my cocoon. I discovered emancipation from petty thinking that allowed me to love everyone in my life. I discovered how the goodness we strive for germinates in our heart from our own goodness. I discovered how we never belong to anywhere and yet we belong to everywhere. I discovered how we are nothing and yet we are everything. I discovered that I have developed wings and that I have become a Butterfly who started her trail blindly and so, is never afraid to fly anywhere anytime. My Bucket list was never a bucket list, it has always been a blind list.